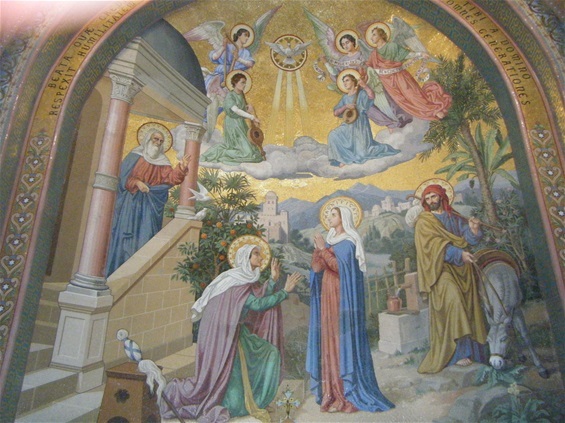 The following prayers were written to our Blessed Lady and are based on the five Joyful mysteries of the Holy Rosary. Each prayer has been inspired by the life of our Blessed Lady and her Son, Jesus Christ as written in Sacred Scripture. The prayers can be simply read or used to enter into deeper prayer and reflection. 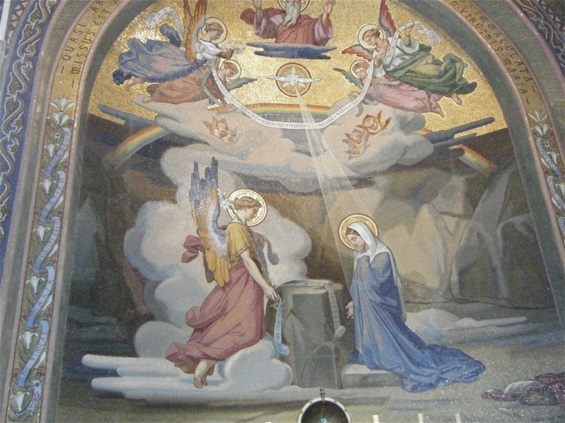 Oh sweet and beautiful Mother Mary, Mother of Christ our Saviour and Mother of the Church. When you were a young woman God sent the Angel Gabriel to you with a message. He came and offered you divine peace and told you that the Lord was with you and had greatly blessed you. You sweet Mother were deeply troubled and wondered what his words meant. The Angel told you not to be afraid that God had been gracious to you and that you would become pregnant and give birth to a son and you would name him Jesus. He would be great and would be called the Son of God. He also revealed to you that your cousin was six months with child and that there is nothing that God cannot do. A lot to take in sweet Mother and yet you took all that was said to heart and you became the Lord’s servant upon the utterance of a mighty “Yes.” My sweet and beautiful Mother Mary, God offers me his peace and blesses me. Each day he is with me in all the steps that I take. Help me to recognise God in every moment. Let me not be troubled when God asks something of me. I can question, I can seek and know that God will be gracious to me. Remind me that the Holy Spirit is with me and I only have to whisper a word to Him. When God reveals things to me, may I thank Him and bless His Holy name. Let me never doubt that all things are possible to God. Help me to willingly serve God each day and please ask Him to increase my faith. Thank you sweet Mother for your great Yes and please thank God for His heavenly plan. Amen. My sweet and beautiful Mother Mary, you were obedient to the law of both God and man. Help me to do all that God asks of me as a Christian. Help me also to follow His way and not man’s. Sweet Mother, you were about to give birth and had no place to have your child, no welcome, no comfort, no charity. May I learn from this and not repeat it. Grant me the grace to help all those in need and without love or a home, especially pregnant women. 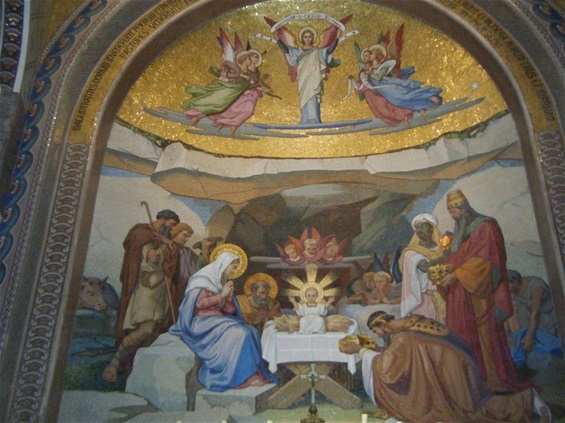 You wrapped your new born child in strips of cloth and laid Him in a manger for all mankind to gaze upon. I thank you for the gift of this new born child, for the gift of your Son and His gift of salvation. Teach me to have a generous heart just like you. Help me to welcome all and never turn anyone away. May I learn to humbly accept things as they are given to me by God and not look for more or for better. Please show me how to bring you and your Son to others in each day of my life. Amen. Oh sweet and beautiful Mother Mary, how obedient you and Joseph were to the law of Moses and the law of God. 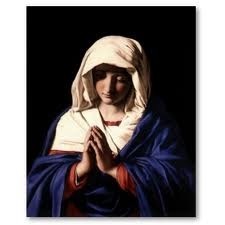 Help me sweet Mother to be obedient to the law of man but only when it is in keeping with the law of God. Never allow me to disobey God’s law in any matter. Like you, may I be true to His every word. What Joy you must have felt when you presented your first born Son, Jesus, to the Lord. As parents prepare to bring their new born children to God for Baptism, may they experience some of your joy and continue bringing their children to God. 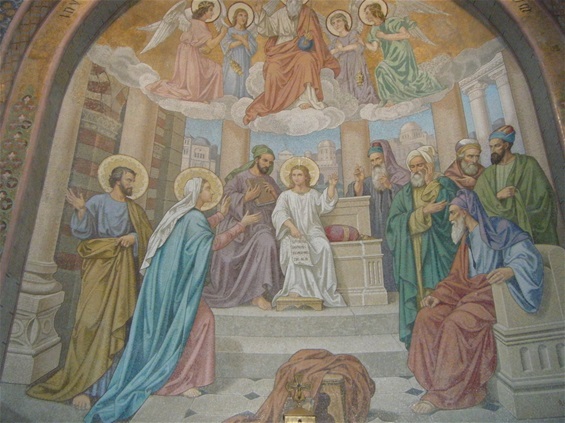 May there be many holy men and women in our churches and may they be filled with God’s Holy Spirit. 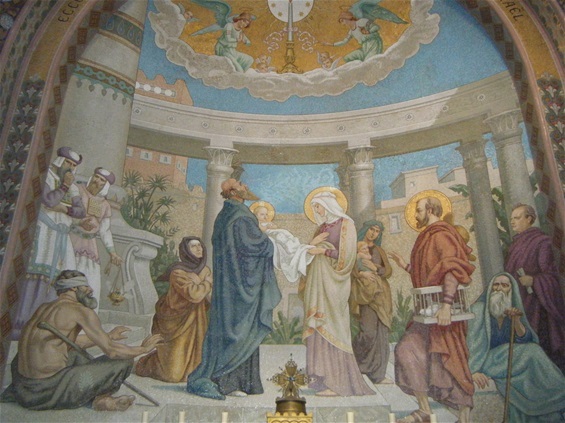 You and Joseph were amazed at what Simeon said about Jesus. I pray that all God’s people will be amazed also as they listen to their Priest’s speaking about Jesus Christ your Son Our Lord and Saviour. How hard it must have been for you dear mother when you heard from Simeon that people would speak against your Son and that your heart would be broken. May you be close to mothers who suffer on account of their children. Help them as they carry their cross. I pray that there will be more people like Anna, who are willing to spend their time worshiping and thanking God and who fast and pray for the needs of our world today. Amen. My sweet and beautiful Mother Mary, when Jesus was twelve years old, you went to the festival as usual. On your return you discovered He was not with you, you thought He was with the group. It was three days before you found him. He was sitting in the Temple with the Jewish Teacher, listening and asking questions. How awful dear Mother to not know where your child is. What worry and anxiety you and Joseph must have experienced. After three days you found Him safe and well in the Temple with the Jewish Teachers listening and asking questions. How wonderful to find your Son, Jesus Christ, what joy you both must have experienced. I pray that parents who find lost children will give glory, thanks and praise to God for their safe return. For those who never find their missing child, I pray that you will wrap your mantle around them and God will give them the grace and strength to cope. Jesus was found in the Temple, listening and asking questions, I pray for children who will listen to no one and as a result fall on hard times. I pray for their parents who have to deal with the consequences. Upon finding Jesus, beloved Mother, you entered into peaceful dialogue, you expressed how you and Joseph felt and all ended well. Jesus went back with you to Nazareth and was obedient. Help families who do not know how to communicate peacefully with each other and who end up hurting themselves. Jesus grew both in body and in wisdom, and He gained favour with God and men. I pray that all children will listen like Jesus, will learn to be obedient to their parents, grow in body and wisdom and may they also gain favour with God. Amen.